Today in Masonic History Thomas Matthew Berry passed away in 1951. Thomas Matthew Berry was an American politician. Berry was born on April 23rd, 1879 in Paddock, Nebraska. He attended schools in nearby O'Neill, Nebraska. At the age of 18 he moved to South Dakota where he established a homestead Gregory County. He moved around two more times before settling in Mellette County where he built a 30,000 acre ranch where he raised Hereford cattle and saddle horses. In 1925, Berry was elected to the South Dakota House of Representatives as a Democrat. He served in the house until 1931. 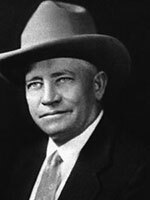 In 1932 Berry was elected Governor of South Dakota. He assisted with South Dakota's recovery from the Great Depression during his time in office. He acted as Federal Relief Administrator, part of his job as Governor, to help secure federal aid. He also called the South Dakota Legislature into special session to legalize 3.2 percent beer and again to enact unemployment insurance. He also, during his time in office, had the state property tax abolished, which was replaced by a gross income tax. The gross income tax was later replaced by a state sales tax. Berry was reelected to a second term as Governor in 1934. He failed in a third attempt in 1936. Berry ran two times for the United States Senate. In the Democratic primary for both elections, one in 1938 and one in 1942, he defeated the sitting Senator only to be defeated in the general election. The second defeat in 1942, marked the end of his political career. From 1942 to 1947, Berry served as director of the Farm Credit Administration in Omaha, Nebraska. Berry retired to Rapid City, South Dakota where he passed away on October 30th, 1951. Berry was a member of White River Lodge No. 181 in White River, South Dakota. He was also a 32° member of the Ancient Accepted Scottish Rite in Oriental Consistory in Yankton, South Dakota.